India's lone gymnast Dipa Karmarkar, who finished fourth at the 2016 Rio Olympics, has returned the BMW handed over to her by cricketing great Sachin Tendulkar. The luxurious car was presented to the 22-year-old for her incredible performance at the Olympics, despite not winning a medal. 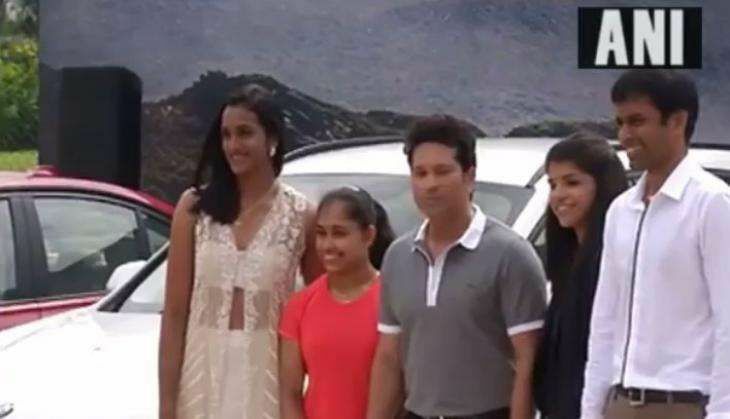 While Sachin did the honours, it was actually Hyderabad District Badminton Association that presented the cars to Dipa, silver Olympic medallist PV Sindhu, bronze Olympic medallist Sakshi Malik and Sindhu's coach Pullela Gopichand amidst much fanfare at a function in Hyderabad in August. Speaking to IANS back then, Dipa had said: "There is no showroom or service centre of BMW car in Tripura. If the car developed any technical snag during driving, how would I repair this? There are also not sufficient suitable roads in Agartala and other places of the mountainous state to ply the luxury car. Sir ( Bisheshwar Nandi - her coach) discussed these matters with V Chamundeshwarnath. He agreed to deposit money equal to a BMW car cost to my bank account. We would be happy whatever amount they give instead of the BMW car." According to Nandi, Karmarkar's family has bought a new car instead with the money (Rs 25 lakh) she received in exchange.